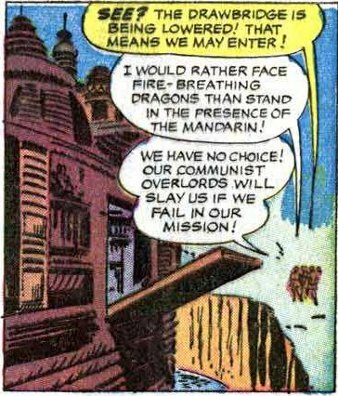 The panel above shows four fearful Chinese military officers who have been sent to negotiate with the Mandarin, who, interestingly, was a Chinese super-villain but not a Communist; his demeanour and trappings were all from imperial China (at least, as seen by westerners in the 60s). We’ll be seeing more of the four — and the Mandarin himself — in the near future. Meanwhile, I couldn’t be compiling this list and not include such a delicious quote as “Our Communist overlords will slay us if we fail in our mission” — or, translation, Communist leaders are evil (hey, but aren’t you “commies” as well?) and regularly kill underlings for failing. Then again, that comes straight from the official Evil Overlord manual, doesn’t it?